The title of this post probably means nothing to you unless you’ve been hanging out on Periscope lately. If you’re really confused now and are asking yourself “What the heck is Periscope?”, let me explain. Periscope is a free mobile app that was recently purchased by Twitter. It’s been out for a few months now and it allows you to stream or watch live video from your iOS device (iPhone, iPad and iPod Touch). Once you download the app, follow the setup instructions to connect it to your Twitter account, decide who you want to follow, then tap the button to start broadcasting live video from your iPhone. It’s that simple! Your followers will receive a notification that you’re “live” so they can watch your video stream and interact with you by typing messages or showing their support by tapping their screens which in turn displays floating hearts on your screen. The Periscope app has some options for how you broadcast and share your video. You can make your video stream private by selecting only the followers you want to see your video before starting the broadcast. You can also choose to show or hide your location and select whether anyone or just your followers can interact with you by chatting or sending hearts. There’s also an option to automatically post your broadcast to Twitter. It’s amazing to watch live video feeds from all over the world and to share an event or experience in real time with your family, friends or all of your followers. It’s entertaining to check Periscope occasionally just to see what other people are broadcasting and that’s how I stumbled upon Sock Cop a few weeks ago. I don’t want to ruin your experience of hanging out with Sock Cop on Periscope for the first time, so head to the App Store, download Periscope and follow @jasonburglar to find out what he’s all about. This past weekend I decided to try my first Periscope broadcast and in the spirit of Sock Cop and Haley’s love of chewing on socks, here’s my very rough attempt at broadcasting live on Periscope. If this made absolutely no sense to you, I’m sure you’re not alone. No, I haven’t gone off the deep end just yet, although my son and daughter-in-law called me after the broadcast asking if I was alright, haha! Thank you Brandon for giving me a “pity heart” during the broadcast! I realized after my first broadcast that I didn’t save the upload for replay on Periscope when I was finished, so the video above is missing the questions, comments and hearts, but that might be a good thing since this was my first attempt. I’m kidding, I’ve found that most people on Periscope are very kind with their comments. Here’s a short retake I did later that night to capture all the details of a broadcast session. Yeah, those were pretty rough, but now that my first Periscope experiment and broadcasts are over, I’ll be a lot less nervous next time. I’m anxious to use the app more this summer to stream live from some special events and hiking adventures. I also noticed some of my favorite dog bloggers, DOGthusiast, Fidose of Reality, Sugar the Golden Retriever and Lola the Pitty are on Periscope, so I’m hoping to see some of their live broadcasts soon. 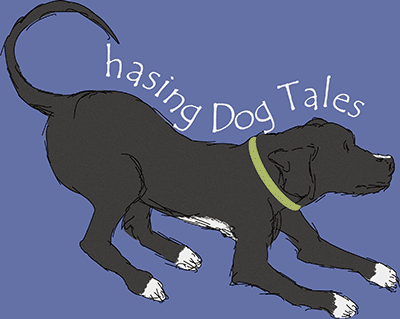 If you haven’t tried the Periscope app yet, download it today from the App Store and follow @chasingdogtales on Twitter and then on Periscope to see my future broadcasts (which should prove to be much more interesting.) Don’t forget to also follow @jasonburglar, aka Sock Cop. Show him some love on Periscope and he’ll eat your hearts, answer your questions and make you laugh! The Periscope development team is working on the Android version of the app now, so hang in there Android users and look for it soon. Have you tried Periscope yet? Never heard of it. We aren’t big on live chat or video stuff, though. Mom doesn’t like to “be seen” or “heard”. Videos are something we do on occasion, but not too much as we don’t like watching them much. I’m sure it is a confusing app at first, but everything new always has a learning curve. 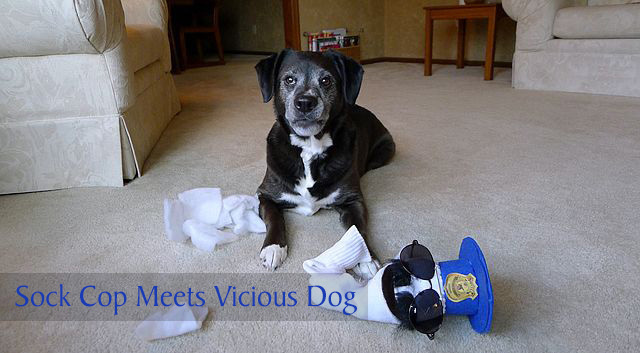 We will have to check out the sock cop! Very interesting ~ I haven’t heard of Periscope yet, but will check it out! Ts ts, Haley, you have to be careful around those cops…they will definitely pull you over and ticket you!! Yes, check it out when you get a chance, Barbara. It’s fun and it’s free! Interesting, and I have never heard of this either!!!! I’ll definitely check it out! This is certainly a new one on me. Will look into it perhaps I can share some of JAx’s wild moments (he has many during the course of the day). Thanks for sharing this new app with us. That would be fun to watch, Cathy. The peoples (as Sock Cop would say) on Periscope love puppies! Harley and Jax would be a hit! Mr. N can be pretty goofy but I think it’s more of a spontaneous thing! I don’t know if we’ll live stream but it sounds like it would be fun to watch occasionally. That sounds like a really cool app. We will have to look into it! Thanks for sharing! We haven’t checked it out yet. Sounds fun! Periscope users would love to see your gorgeous puppies! We’ve never heard of that but it’s very interesting! The app is just starting to catch on with some users, but it’s a lot of fun and there are so many practical applications for it as well. I heard about this (and Meercat) on the news. Sounds a lot like Vine, only longer/real time video. I never did get into Vine,although I had the app on my phone for a while. I must confess I doubt I’ll get into this one either. Too much social media, too little time! Cute videos though! Thanks for sharing!